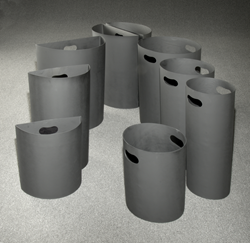 Glaro Inc. has upgraded its removable inner liners from steel to plastic for most of the receptacle lines to meet customer demand and to improve the speed and efficiency of servicing by janitorial staff. We are producing some of the finest quality rigid plastic molded inner liners available. They are heavy duty, made from recycled content, and extremely durable. Each has the Glaro Inc. logo embossed on it confirming our stamp of approval. Manufacturer Glaro Inc. announces an important product upgrade to its well-known receptacles. Most waste and recycling receptacles (not including the Value lines) now come standard with removable heavy-duty molded rigid plastic inner liners. The new liners, made with recycled plastic, will save janitorial staff time because they are lighter, easier to lift out, and convenient to clean. In addition, shipping will be less costly. “The outer receptacles remain unchanged and continue to be offered in a multitude of attractive sizes and finishes,” states Executive Vice President Robert Betensky. Most ash/trash receptacles will have a removable plastic inner liner can for the trash compartment. “We are producing some of the finest quality rigid plastic molded inner liners available. They are heavy duty, made from recycled content, and extremely durable. Each has the Glaro Inc. logo embossed on it confirming our stamp of approval,” reports Robert Betensky, Executive Vice President. Glaro Inc., a New York based company, manufacturers product lines including bellman and luggage carts, platform trucks, metal trash receptacles, smoker’s posts and receptacles, crowd control posts and systems, safety barriers, signs, sign frames, directories, coat hanging equipment, coat trees, indoor umbrella holders, wet umbrella bag stands and bags, metal planters, and key drop boxes. The company recently launched a line of anti-bacterial wipe dispensers, FDA approved wipes, and coordinating receptacles.